Dynamic MR measurements with Ergospect technology open up new avenues for investigating muscle physiology and energy metabolism in the musculature. This is suitable for a number of applications including sports medicine: training control in high-performance and recreational athletes, degenerative diseases as well as cancer patients: assessment of muscle function and metabolic status, lifestyle: testing aerobic capacities and muscular strength. But why is mitochondrial function so important? Oxidative phosphorylation and glycolysis are the most important sources of cellular energy. Mitochondria account for ATP production through oxidative phosphorylation. Consequently, mitochondrial performance is crucial for organ function, whereas mitochondrial dysfunction plays a major role in the onset of a number of degenerative diseases including type 2 diabetes, dyslipidaemia and sarcopenia. Which processes can be measured? As the muscles start to work, energy demand within the myofibrils of the muscle is increased. To provide energy for the muscular contraction, the high-energy molecule adenosine triphosphate (ATP) is split into adenosine diphosphate (ADP) and inorganic phosphate as well as H+ ions by the ATPase enzyme. In order to rephosphorylate ADP to ATP, a phosphate group of the phosphocreatine (PCr) is transferred to ADP by the creatine kinase reaction. Creatine itself is rephosphorylated in the mitochondria to PCr. PCr acts as an intermediate energy buffer and ‘shuttles’ energy-rich phosphates from the mitochondria to the myofibrils, connecting sites of energy production with sites of energy utilization. At the onset of muscular work, mitochondrial ATP production is too low to completely rephosphorylate creatine to PCr. This triggers a progressive PCr decline in the cytosol. The muscle cell tries to partially cover ATP demand by anaerobic glycolysis – this phase is termed the anaerobic phase. More ATP for the oxidative rephosphorylation of creatine can be provided by enzymatic activation and increased oxygen supply by means of an increased blood flow, finally leading to PCr hydrolysis equilibrium/steady-state und rephosphorylation. This equilibrium normally follows a mono-exponential course. The time constants which express the transition phase of progressive PCr decline to reach a steady state ranging from 30 to 60 seconds in healthy subjects, and correlate with the increased perfusion of the supply arteries. In order to calculate appropriate time constants a temporal resolution of 5 to 15 seconds as well as an MR-compatible ergometer with adjustable load-intervals is required during the measurement. However, most conventional systems cannot adjust the power output during the measurement because the power output is not indicated online in an appropriate manner. The time constants allow evaluation of mitochondrial oxygen turnover within the muscle. 31P MRS spectroscopy is thereby a unique method for measuring the achievements of the so-called power stations of the cell. Via this approach, the recovery of PCr from exercise in skeletal muscle is a reliable and accepted measure of oxidative capacity. Why is 31P MRS important in the field of sports medicine? In muscle physiology, mitochondrial function determined by the time constant of PCr recovery after a tiring load, is of particular interest. Endurance athletes show faster regeneration of PCr compared to sprint-trained athletes (Pesta 2010). Endurance exercise leads to mitochondrial biogenesis and hence to an increased mitochondrial density in the muscle. Apart from mitochondrial function, muscle fibre composition is very important for performance. Skeletal muscle consists of different types of fibre, which can usually be distinguished in terms of contractile (type I, IIa and IIx) or metabolic (oxidative, glycolytic) properties. Types I and IIa show a lower power output per time unit but are relatively resistant to fatigue. Type IIx fibres show a high power output but tire rather quickly. Dynamic 31P-MRS can be used to estimate muscle fibre distribution on the basis of changes in the intracellular pH (different degree of metabolic acidification in the different muscle fibres). 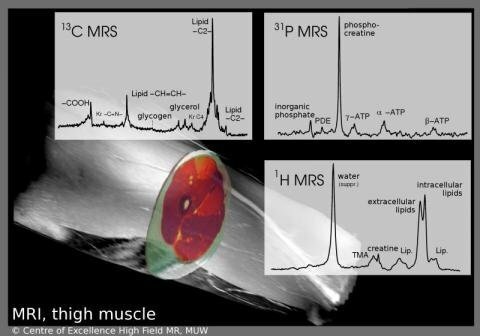 31P-MRS is currently used to investigate the biochemical processes leading to muscle fatigue. Two theories are intensely debated at the present time. Acidosis by accumulation of (1) [H+] ions and (2) inorganic phosphate warrant increased Ca2+ concentrations during intensive workload. How does the method function in clinical routine? Leading scientific sports institutes have used this method to assess muscle function on the basis of auxotonic contractions in different sports disciplines. This technology offers new options for athletes and coaches by monitoring and interpreting the working muscle in the training context. Armed with this knowledge, training and related measures can be planned to promote scientifically controlled, optimised training schedules in any given sport.